When you're first learning how to use Google Ads (also known as AdWords), the native AdWords keyword tool is a great way to establish a baseline list of keyword ideas for your online advertising campaigns. But don’t stop there. Keyword research is one of the most important parts of a successful Google advertising campaign. You need the right keywords and you need an easy way to expand and improve your keyword lists. While Google’s keyword tool is an excellent starting point, relying on one tool alone can lead to missed opportunities, particularly in today’s intensely competitive online advertising landscape. That's where WordStream comes in. WordStream's new and improved Free Keyword Tool is designed specifically with Google Ads users in mind, with unique features to help you find your best keyword opportunities for AdWords or any online marketing campaign. You’ll get thousands of keyword results, tailored to your own business, industry, geography and more, all for free. Hundreds of relevant keywords - Our Free Keyword Tool gives you hundreds of keywords that are relevant to your exact business and industry – even tailored to your own AdWords account performance. You can also get the full list of keywords sent straight to your inbox in a CSV format, ready to upload into AdWords. Unique keyword data specific to YOUR industry – You’ll also get related keyword data including competition level and estimated AdWords CPCs based on established performance benchmarks for your industry, making results significantly more relevant and actionable. Location-specific results – Geographic location can have a dramatic impact on metrics like cost-per-click and click-through rate. That’s why WordStream’s Free Keyword Tool offers personalized keyword data based on your geographic location. Opportunity Score – WordStream’s Free Keyword Tool features a proprietary metric known as Opportunity Score, calculated to determine the potential impact of each keyword on a scale of 1-10 (1 being the worst and 10 being the best). Use the Opportunity Score to quickly and easily identify keywords that offer the greatest return on investment, helping you prioritize your work and allocate budget where it counts. Full Integration with Google AdWords: If you’re an AdWords user, you can securely connect your AdWords account to WordStream’s Free Keyword Tool to get personalized data and even more relevant keywords. As you can see in the figure above, WordStream’s Free Keyword Tool offers a range of data based on your original keyword query, including relevant keywords, Google Search Volume, Competition, CPC, and WordStream’s proprietary Opportunity Score metric. In the example above, you can see that the keyword “cars for sale” has an approximate monthly Google search volume of around 1.2 million searches per month, and that this keyword is of Medium competitiveness. You can also see that with an average CPC of just $1.35 and an Opportunity Score of 10, this keyword represents a potentially lucrative opportunity for advertisers in this vertical. WordStream’s Opportunity Score metric allows you to see at-a-glance which keywords are likely to have the greatest impact, offering crucial time savings. Keyword research is the most crucial foundational step to preparing and launching a successful online advertising campaign. With so many business decisions dependent on the results of this preliminary keyword research – including your advertising budget – it’s vital that your keyword research data provides you with the information you need to make informed decisions. That’s why using WordStream’s Free Keyword Tool alongside Google AdWords tools as part of your search marketing workflow is so effective. WordStream has helped thousands of small businesses increase leads and sales through Google Ads. We know that your time is limited and valuable, which is why our Free Keyword Tool helps you to find the information you need to launch high-impact online advertising campaigns quickly and easily, allowing you to focus on what really matters – taking care of your customers. Try WordStream’s Free Keyword Tool today and see how much more effective your ad campaigns can be with WordStream. Like our Keyword Tools? Try our Free Google Ads Performance Grader! 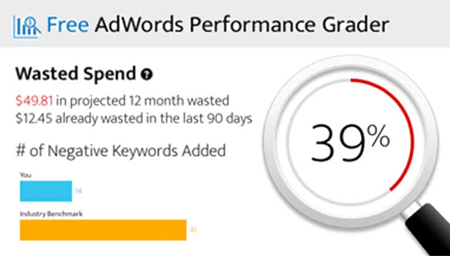 WordStream’s AdWords Performance Grader is a comprehensive free tool that helps you evaluate how your Google ad campaigns are performing based off of several key criteria. Looking at indicators such as Quality Score, Account Activity, Impression Share, and Click-Through Rate, the Performance Grader analyzes your AdWords campaigns and compares your score with relative competitors. The AdWords Performance Grader shows you where and how to make improvements to your AdWords campaign that will improve your performance and save you money. It’s an expert analysis, and it’s absolutely free! Don't pin all your search marketing hopes on Google's native tools. See for yourself the difference private, personalized keyword research can make. Learn more about WordStream: Sign up for a free trial of WordStream Advisor. With WordStream, beating AdWords at the PPC game has never been easier.